All-in-One Contact Center Solution | Systems Integration, Inc.
Delivering outstanding customer service is the greatest opportunity for differentiation. And SII can help make it a reality with an all-in-one contact center solution, Customer Interaction CenterSM (CIC) from Interactive Intelligence (ININ). Why Customer Interaction CenterSM (CIC)? 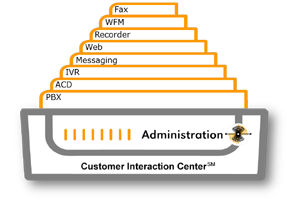 The CIC is a single “all-in-one” platform for voice and data that seamlessly processes telephone calls (including Internet Protocol calls), emails, faxes, voice mail messages, Internet chat sessions, and call back requests. It eliminates often fragmented contact center environments by applying business rules across media types for delivering superior customer experience. Give contact center managers the necessary tools to optimize the performance of the entire workforce. Help agents and supervisors recognize customer cues through spoken words and react in a positive and effective manner. Consistent cross-channel (voice, email, web chat, social media) interaction is critical to delivering a superior customer experience. SII’s state-of-the-art contact center solution ensures this by seamlessly preserving and integrating customer conversations and interaction across multiple touch points. A predictive dialer system that powers virtually any outbound environment – contact centers, outsourcers, collections – and for predictive dialing scenarios for all kinds. Create and manage automated surveys to better quantify customer perceptions and pinpoint key areas for improvement. Enable customers to connect directly with your contact center via a mobile app that is easy to deploy. Comprehensive multichannel recording capabilities that help your business optimize customer care, agent performance, and regulatory compliance. Get an instant view of the contact center operations via secure web access. Check out other features in our resources center.